To Kill a Mockingbird is one of my favorite books. I read it many years ago as a teenager, and growing up in a small Southern town, I could relate to many of the characters Harper Lee created. After reading the book, I saw the movie, and my admiration for Atticus Finch, so ably portrayed by Gregory Peck, increased after seeing the screen adaptation. As a young adult, I listened to the book on tape while commuting to my first job after graduate school. Even though I knew the story well, still I cried when the jury found Tom Robinson guilty. I remember blinking away tears as I drove the streets of Boston after hearing the verdict. This school year, my son read the book during his English class, and I enjoyed talking with him as he discovered this treasure. 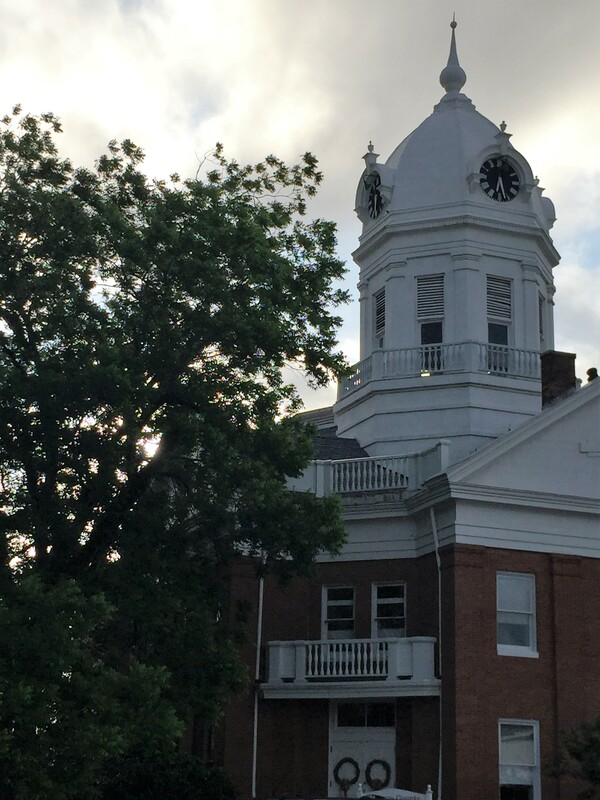 One of the highlights of moving to Northwest Florida’s Gulf coast is that I can drive to Monroeville, Alabama, Harper Lee’s hometown, in about two and a half hours. A few days ago, our family joined the small crowd making the pilgrimage to Monroeville. 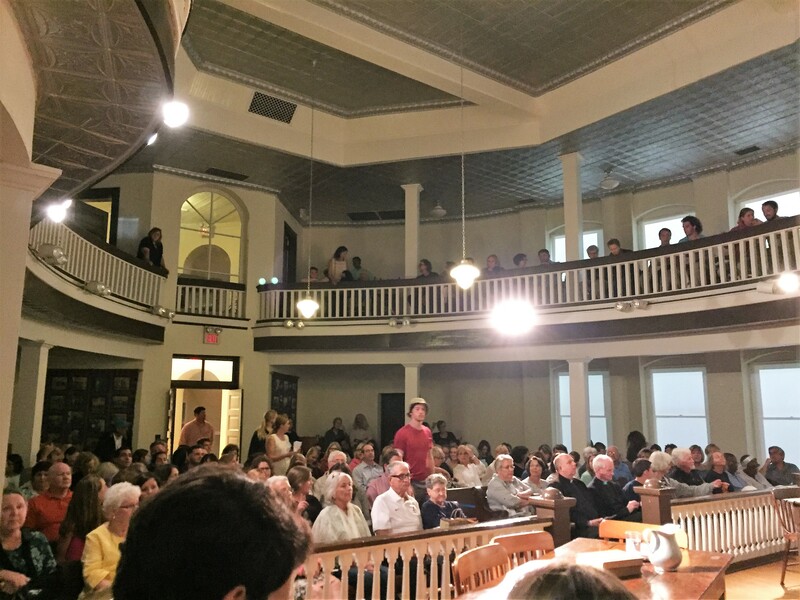 We watched the Mockingbird Players perform the stage version at the Old Courthouse Museum, which this all-volunteer cast has done for twenty-seven years. The first act took place outside the courthouse, and we were introduced to Scout, Jem, Dill, Calpurnia, Atticus, and their neighbors. We saw racism grow among the residents. I was startled to hear the N word used so freely by the characters, and looking around the audience, I wondered how others felt when hearing this offensive term. We watched fear fester as neighbors talk about Boo Radley. During the first act, Scout and Jem were amazed by their father’s skill when he shot a rabid dog, and as the act ended, Atticus calmly but courageously faced the lynch mob outside the jail where Tom Robinson was awaiting trial. The second act took place in the courtroom. Twelve white men were selected to sit on the jury, and the remaining seats were open for the audience. 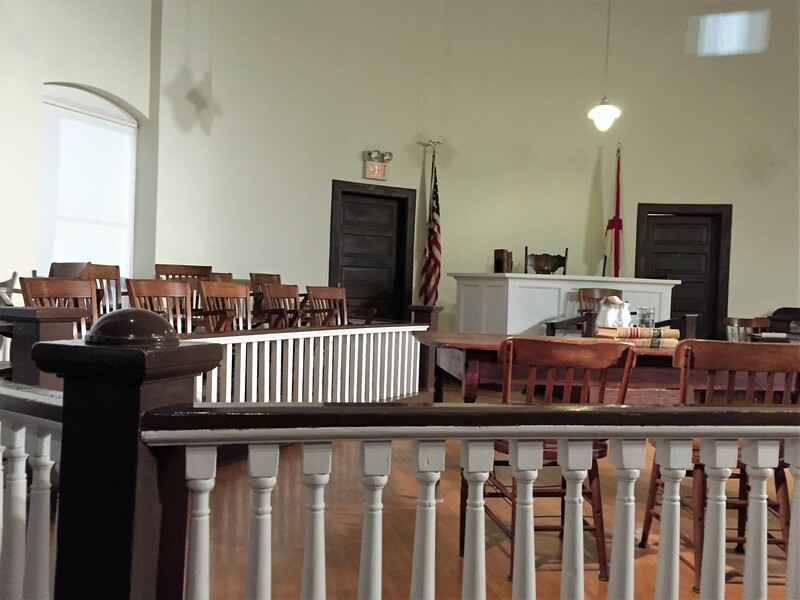 Our family sat in the grand jury box between the judge’s chair and the prosecutor’s table. We were able to see the faces of Tom Robinson and his accuser, Mayella Ewell, as the proceedings developed. We were so close to Atticus Finch as he defended Tom that we could have touched him. And, of course, we were very close when the jury found Tom guilty. The second act included Boo Radley saving Scout and Jem, and it concluded with Scout’s growing understanding of life in her town and her father’s courage through it all. 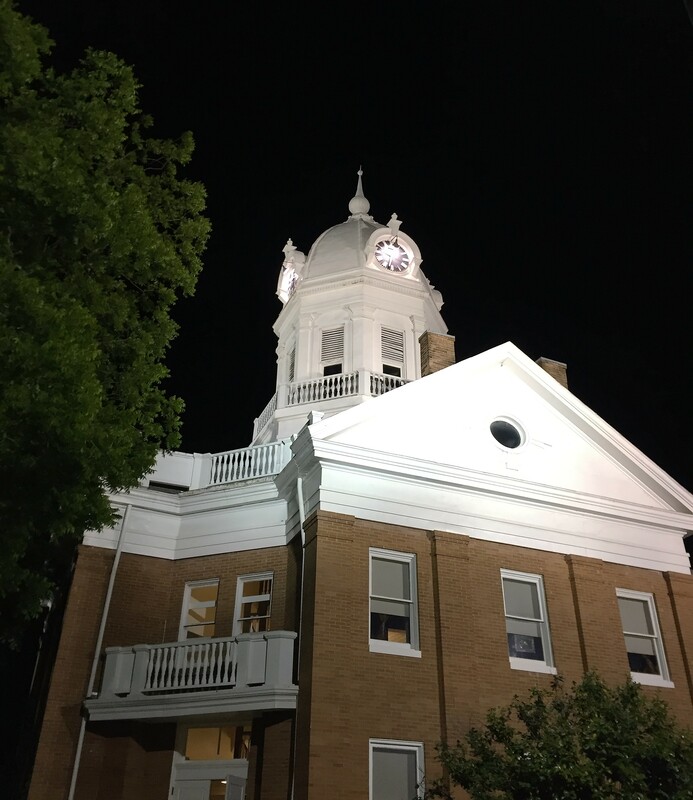 Atticus Finch said, “You never really understand a person until you consider things from his point of view.” Thankfully, sitting in the grand jury box gave us a wonderful view to consider things from the perspectives of Atticus Finch, Mayella Ewell, her father Bob Ewell, and Tom Robinson. 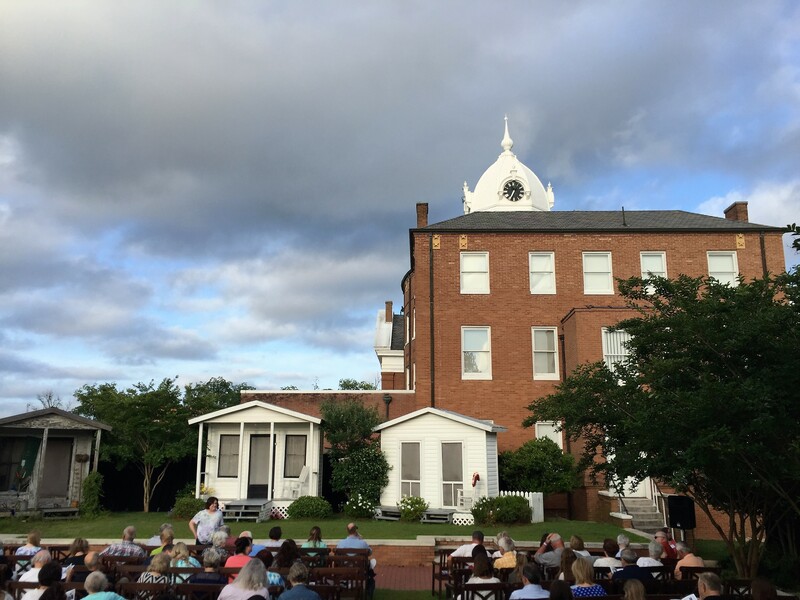 The play runs during April and May of each year, and the quality of the acting is amazing considering that all of the actors volunteer their time and energy. The cast begins rehearsing in February each year, and they give of themselves until the final performance in late May. Witnessing the play was a highlight of Spring for me, and I especially was delighted to share the experience with my wife and children. Stuart Richeson played Judge Taylor the night we watched the play. In the playbill, he said, “The message is timeless – one man determined to do what is right, even though society resists him.” I agree, and I recommend the play to anyone. This entry was posted in Travel on June 5, 2016 by Dean Allen.